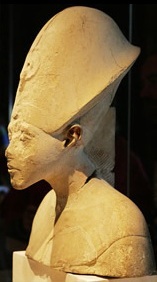 Just one of the many manifestations of Pharaonic Mars when in close proximity to earth only a few thousand years ago. The blue crown – a symbolic representation of Mars with a flared ring of debris around its girth. It is presumed the reader has a basic understanding of the God King Scenario. Elongated, rounded crown with a flared bulge or ridge passing around the back and studded with dotted circles. In reliefs and paintings its colour is shown as blue, a prestigious characteristic linked to the king in his active roles, in battle or carrying out rituals in the temples. 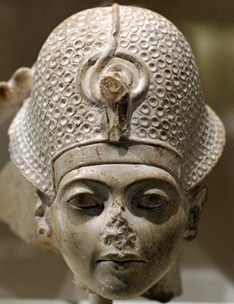 The crown first made its appearance in the New Kingdom. Why such an odd distorted bulbous design? Who invented it and why? It certainly doesn’t follow the contours of the head. What of the flared bulge, what does this represent? Why blue? Why did it first appear during the New Kingdom? What do the dotted circles represent? On this, scholars have NO answers whatsoever. Mars was once like earth in every sense in that it was home to an electromagnetic field which shielded a human habitable atmosphere, vast oceans, land masses, mountains and valleys. 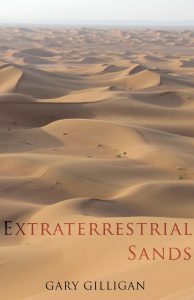 Three thousand years of planetary encounters with earth has seen Mars in the guise of Egypt’s god kings literally battle (Pharaonic battles) itself from an earth-like planet to its now frozen desolate state. During its demise and depending upon its location in respect to earth and the Sun (Re), Mars took on many forms. The main one being an incandescent red disk which was perceived to be protected by the cobra as a result of huge snake-like lava eruptions seen lashing out into space (see Cobra Goddess Wadjet). 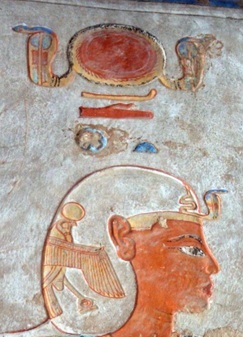 The image on the right shows Ramesses Mars with the traditional red disk of Mars above his head. Another common form pertaining to Mars was that of a gigantic comet as its atmosphere is stripped from its surface to form two enormous cometary tails as in the image left. Of interest here, however, is the many times Mars appeared in the shape and image of the blue crown. 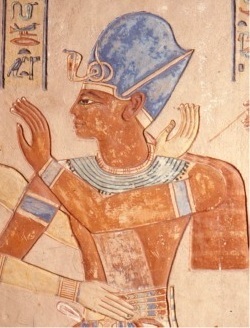 The blue crown worn by the Pharaohs came about as a direct result of physical observations of a spinning Mars appearing blue while in absolute turmoil in close proximity to earth in the New Kingdom. The unusual bulbous shape represents the distorted shape of Mars when in close proximity to earth. The flared bulge or ridge represents a very thick but distinct ring of debris around Mars’ girth, while the dotted circles are symbolic of hundreds of swirling vortices, or hurricane-like storms covering the surface of Mars (similar to those found on Saturn and Jupiter today) prior to, and during, the total depletion of its atmosphere. Of course as per The God King Scenario such orbs were not planets, they were god kings amidst a wide range of sky gods such as Hathor, Isis, Osiris, Horus, etc. The way forward here is to use the Lord of the Rings Saturn as an analogy. Today Saturn’s rings appear sharp and defined (left) but what if Saturn was pummelled by space debris on a colossal scale? Rebounding debris would cause its atmosphere and thus the planet to swell in size. Its ring system would also thicken and become more dense to form one gigantic bulge around its equatorial region, merging with Saturn’s already inflated atmosphere. In studying the blue crown, this is similar to what I believe occurred with Mars during Pharaonic times. To gain an insight into what was seen, below left we have Tutankhamun (guise of Mars) shown wearing the blue crown (once painted blue), on the right I have superimposed an ‘oversized’ blue ‘Mars’ onto Saturn and its rings and painted them blue with a few ‘hurricane’ storms which we will discuss shortly. Comparing the basic outline of the blue crown to that of my ‘blue Mars’ model, as I’m sure you will agree, the similarity is obvious. Especially the angle of which the flared bulge protrudes from the two sides of the crown. If we were to add a little dust and debris into the equation they’d be virtually identical. The unusual distorted shape of the blue crown originated as a result of the tidal forces exerted on Mars by the more massive earth when in close proximity to earth. 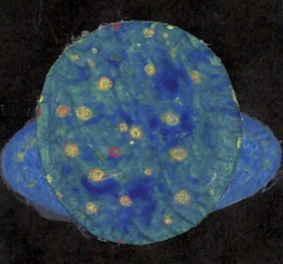 Mars became stretched, almost egg-shaped, the same basic shape as the blue crown. This would be very similar to the gravitational forces at play between the Earth-Moon system. 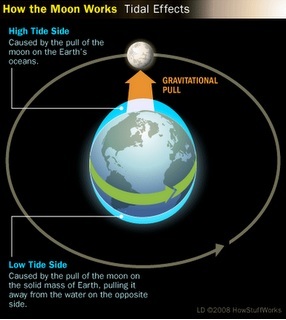 For example, on the left is an image demonstrating how the Moon creates two tidal bulges on earth, one on the side facing the Moon and one on the far side resulting in the earth taking on an oval, or egg-shape. Of course this is greatly exaggerated for demonstration purposes, however, with Mars in close proximity to earth only a few thousand years ago there was no need for exaggeration – the tidal forces involved were tremendous. 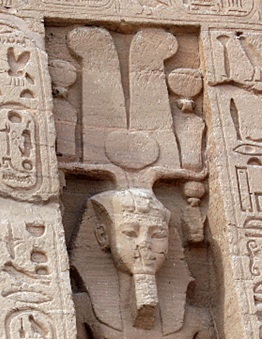 Pharaonic Mars became distorted to such an extent it appeared egg-shaped. The Egyptian’s in veneration of their astral doubles (souls) duly represented this common apparition in the kingly blue crown. It should be noted that the Moon even today is not a perfect sphere, it is in fact egg-shaped due to the tidal force of earth. This egg-shape would be almost identical to the blue crown worn by Tutankhamun above and, viewing face on, even down to the small end of the egg/crown pointing towards earth. 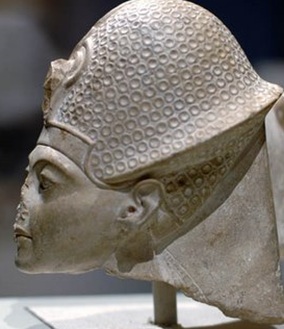 Prior to and during the birth of the Mercury (The Amarna Period), Mars became distorted to such an extent that the god king responsible for giving birth (Akhenaten Mars) was depicted deformed and without any hint of genitalia (confusing times, what do you expect). His blue crown was also accordingly shown extremely distorted as in the image below. 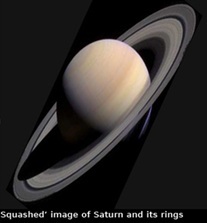 For comparison purposes, on the right we have a slightly squashed Saturn.